Hasim Sharif Rahman (born November 7, 1972) is an American former professional boxer who competed from 1994 to 2014. He is a two-time world heavyweight champion, having held the unified WBC, IBF, IBO and lineal titles in 2001; and the WBC title again from 2005 to 2006. Rahman first became known on the world stage in 2001 when he scored an upset knockout victory against Lennox Lewis to win the unified heavyweight championship. Lewis avenged the loss and regained his championship by knocking out Rahman in a rematch later that year. Rahman won the WBC title (initially the interim version) for a second time in 2005 by defeating Monte Barrett, after which the WBC elevated him to full champion status by the year's end. His reign as champion ended in 2006 via another knockout loss, this time to Oleg Maskaev in a rematch of their first fight in 1999. Rahman got a relatively late start in the sport. He was an enforcer for drug dealers, and was known for surviving several shootings. He nearly died in a car accident (which left him with permanent scarring on his cheek and ear) and once survived a shooting where five bullets entered his body. He took up boxing at age 20 and had just 10 amateur bouts before making his pro debut on December 3, 1994, at age 22. Despite his inexperience, Rahman had obvious natural boxing skills that propelled him to 11 knockout wins in his first 12 fights. Then he took a step up in class in March 1996 with a 10-round decision win over veteran Ross Puritty and seven months later, he repeated the feat against former world champion Trevor Berbick. In July 1997, he won the regional USBA heavyweight title, and four months later, he added another regional belt, the IBF Intercontinental heavyweight title. Defending the USBA title three times and the Intercontinental belt twice. By the fall of 1998, he was ranked as one of the top five heavyweights in the world. On December 19, 1998, Rahman faced fellow contender David Tua in a fight to determine the IBF's mandatory contender. Rahman was using his power jab well, out boxing Tua virtually every round. At the end of the 9th round Tua staggered Rahman with a devastating punch after the bell that dazed him. At the beginning of the next round Tua pounced on him immediately and the referee jumped in when Rahman was bobbing and weaving. Tua won by TKO. It was argued that it should have been a DQ. Because of the controversial nature of the loss, Rahman's ranking did not suffer, but in November 1999, he was knocked out by Oleg Maskaev in the eighth round of a fight he looked to be winning. At one point during the match, Rahman was knocked through the ropes onto the floor, hitting his head on the floor. Rahman dropped out of The Ring top 10 as a result of the surprise loss. Rahman later said that he had seen Maskaev earlier in his career get knocked out in the first round by former champion Oliver McCall and he assumed he was brought in as an easy win. Because of this, he did not train as hard as he should have and was beaten. Rahman came back with three wins, including one in May 2000 over Corrie Sanders in a war in which he was dropped twice and came back to win in 7, and after that he was moved back up in the rankings. After this fight, Sanders briefly retired. Finally, on April 22, 2001, Rahman earned a shot at Lennox Lewis the WBC, IBO and IBF heavyweight champion with a win over Frankie Swindell. Rahman beat Swindell via 7th-round RTD. Swindell quit on his stool after the 7th round, informing the ringside doctor that he had suffered an eye injury. In the fight, held at Brakpan, South Africa, Lewis and Rahman traded hard blows for five rounds before Rahman, a 20-to-1 underdog, stunned the crowd by defeating Lewis via 5th-round KO. It was only the second loss of Lewis' career. His first was on September 24, 1994, when Oliver McCall defeated him via 2nd-round TKO. Lewis had an immediate-rematch clause in the contract for his defense against Hasim, and chose to invoke it. Rahman and his new promoter, Don King, made plans to defend the titles against David Izon, rather than giving Lewis his rematch. Lewis sued Rahman in U.S. federal court to enforce their contract. The judge, Neil McCluskey sided with Lewis and on November 17, 2001, in Las Vegas, the two men met again. This time, Lewis knocked Rahman out in the fourth round. For the rematch, Lewis made $11 million and Rahman got $10 million. The fight generated 460,000 pay-per-view buys and $23 million in revenue. Rahman's comeback fight ended in disappointment, he was beaten by a technical decision by aging former champion Evander Holyfield after headbutts from Holyfield caused a massive swelling (severe hematoma) on Rahman's forehead. On March 29, 2003, Rahman faced David Tua for a second time. The fight was ruled a draw after one judge scored it for Rahman, a second for Tua and a third had the score even. Tua was knocked down a split second after the bell rang and it was not ruled an official knockdown. Rahman came in at the heaviest weight of his career. In June, Rahman was elevated to the No. 1 contender's position by the WBC. On December 13, Rahman was matched with former WBA world champion John Ruiz, in a match for an Interim WBA heavyweight title (caused by Roy Jones, Jr. deciding whether he wanted to stay a heavyweight or return to Light Heavyweight). Rahman was favored, but he lost by (twelve round) unanimous decision and again was out of condition. Ruiz, who became interim titleholder with this victory, was upgraded to WBA heavyweight champion after Roy Jones Jr. vacated the title on February 20, 2004, choosing to fight Antonio Tarver for the WBC and IBO light heavyweight titles (already in 2003), rather than Ruiz. After this defeat, Rahman stepped back to a lower level of competition and defeated four journeyman fighters while working to get back into shape. His efforts paid off when he was rewarded with a fight against Kali Meehan on November 13, 2004. The fight was an elimination bout for the IBF, WBA, and WBC, with the winner being the number-one contender in more than one world-title organization. Rahman scored the victory by a fourth-round knockout at New York City's Madison Square Garden. The WBC designated Rahman as Vitali Klitschko's next mandatory challenger; the fight was set for April 30, 2005. Klitschko injured his thigh while training for the fight, so it was rescheduled for June 18. As this date approached, Klitschko's camp said that the thigh had not fully healed; the WBC made July 23 the new fight date. Soon after this second postponement, Vitali's doctors reportedly discovered back injuries that they said demanded minor-yet-immediate corrective surgery. The WBC pushed Rahman's title shot back again, this time to November 12; Rahman's share of the purse following this match would reportedly be around US$4.2 million. After this third rescheduling, Rahman, fought for a WBC "Interim" heavyweight championship and defeated Monte Barrett on August 13, 2005, via unanimous decision. At this point, Klitschko would be stripped of his WBC title if his first fight back was not against Rahman. On November 7, it was announced that Klitschko had suffered severe right knee injuries during training; the WBC said it would strip him of the championship if he was unable to box within 60–90 days of a soon-to-be-announced base date. However, on November 9, Vitali Klitschko retired instead. On November 10, 2005, the WBC voted to award its heavyweight championship to Rahman, making Rahman a two-time heavyweight champion. On December 9, 2005, a U.S. Bankruptcy Court judge ended Rahman's contract with Don King and he signed instead with Top Rank Boxing. On March 18, 2006, Rahman fought James Toney to a draw, in a 12-round fight in Atlantic City, New Jersey, and he retained the WBC heavyweight title. The judges scorecards read 114-114, 117-111 and 114-114. Judges Tom Kaczmarek and Nobuaki Uratani had Toney leading by one point heading into the 12th. Rahman only retained the title by winning the final round. On August 12, 2006, Rahman lost the WBC heavyweight championship to rival Oleg Maskaev by 12th Round TKO in a mandatory defense of his title. Rahman was knocked down early in the 12th round and eventually stumbled to the mat. Rahman was then holding on to the ropes to stay on his feet. Maskaev landed a flurry of punches with Rahman unable to defend himself. The referee stopped the bout to save Rahman from further punishment. Afterwards he said he should have followed his trainer's game plan. After a 10-month layoff, Rahman resumed his career with a ten-round unanimous decision over Taurus Sykes June 14, 2007, at The Main Street Armory in Rochester, New York. Rahman then fought three times in three months defeating Dicky Ryan by second-round TKO on September 7, 2007. Hasim followed up by stopping Cerrone Fox on October 18, 2007. On November 15, 2007, Rahman then scored a 10th-round TKO for the NABF title against Zuri Lawrence. In this fight, Lawrence fell through the ropes on two occasions whilst ducking punches, once in round six and again in round nine. In round six, he landed on the floor below the ring, but beat the referee's 20-count. He received a standing ovation from the crown when he re-entered the ring. On July 16, 2008, Rahman was stopped by an accidental headbutt against James Toney. Toney was originally awarded a TKO victory as the referee declared Rahman had quit between rounds, a week later, the TKO victory was overturned and changed to a No Contest due to the headbutt. After three rounds, Toney was ahead on 29-28 on two of the judges cards while Rahman was ahead, 29-28 on the third card. Rahman lost to Wladimir Klitschko (TKO in the 7th round) on December 13, 2008, for his WBO, IBO & IBF titles in a fight some believe showed himself to be past his best. Klitschko dominated the fight, winning every round while making good use of his left jab. Rahman seemed unable to withstand the Ukrainian's punch power. The referee called a stop to the contest in the 7th round after Rahman failed to respond to a series of shots. In an interview dated February 26, 2009, with DreamFighters.com, Rahman expressed his interest in crossing over into mixed martial arts. Fifteen months after the seventh round loss to Wladimir Klitschko in December 2008, Rahman made a comeback against 43-year-old journeyman Clinton Boldridge winning the fight via TKO 1. Rahman next fought on June 19, 2010, against journeyman Shannon Miller (16–4, 9 KO) in a match that took in the Niagara Falls Conference Centre, Niagara Falls, New York, United States. Rahman came into the ring at 260 pounds and won the bout by TKO in the 4th round, after sending Miller down in each of the four rounds. He then won his next three fights (all by knockout), against Damon Reed, Marcus McGee and Galen Brown. His win over Galen Brown marked Rahmans 50th professional win in his career. He is now 5-0 (all wins via knock out) since his loss to Wladimir Klitschko. He was elevated to the WBA number one contender to face Alexander Povetkin on September 29, 2012, for the WBA regular heavyweight championship. Povetkin beat Rahman via 2nd-round TKO. In yet another attempt to re-enter the heavyweight scene Rahman signed up for the super 8 tournament, an elimination-style event staged in Auckland, New Zealand. But despite holding the tag as tournament favorite the ageing Rahman was outpointed by little-known club fighter Anthony Nansen in the quarter-final on the 4th June 2014. 60 Win 50–7–2 (1) Galen Brown TKO 6 (10), 1:45 Jun 11, 2011 DeSoto Civic Center, Southaven, Mississippi, U.S.
58 Win 48–7–2 (1) Damon Reed KO 6 (10), 2:20 Aug 14, 2010 Scope, Norfolk, Virginia, U.S.
57 Win 47–7–2 (1) Shannon Miller TKO 4 (10), 1:37 Jun 19, 2010 The Conference & Event Center, Niagara Falls, New York, U.S.
56 Win 46–7–2 (1) Clinton Boldridge TKO 1 (6), 2:50 Mar 26, 2010 Beaumont Club, Kansas City, Missouri, U.S.
52 Win 44–6–2 Cerrone Fox TKO 1 (10), 2:27 Oct 18, 2007 Kewadin Casino, Sault Ste. Marie, Michigan, U.S.
51 Win 43–6–2 Dicky Ryan TKO 2 (10), 0:41 Sep 7, 2007 Soaring Eagle Casino & Resort, Mount Pleasant, Michigan, U.S.
46 Win 40–5–1 Kali Meehan RTD 4 (12), 3:00 Nov 13, 2004 Madison Square Garden, New York City, New York, U.S.
45 Win 39–5–1 Terrence Lewis KO 2 (10), 0:43 Jul 28, 2004 Frontier Field, Rochester, New York, U.S.
44 Win 38–5–1 Rob Calloway KO 2 (10), 2:00 Jun 17, 2004 Michael's Eighth Avenue, Glen Burnie, Maryland, U.S.
43 Win 37–5–1 Mario Cawley TKO 2 (8), 2:25 Apr 16, 2004 Dover Downs, Dover, Delaware, U.S.
42 Win 36–5–1 Al Cole UD 10 Mar 11, 2004 Michael's Eighth Avenue, Glen Burnie, Maryland, U.S.
40 Draw 35–4–1 David Tua SD 12 Mar 29, 2003 Spectrum, Philadelphia, Pennsylvania, U.S.
36 Win 34–2 Frankie Swindell RTD 7 (10), 3:00 Aug 4, 2000 The Joint, Paradise, Nevada, U.S.
33 Loss 31–2 Oleg Maskaev KO 8 (10), 0:40 Nov 6, 1999 Boardwalk Hall, Atlantic City, New Jersey, U.S.
32 Win 31–1 Arthur Weathers KO 1 (10), 1:44 Apr 15, 1999 Miccosukee Resort & Gaming, Miami, Florida, U.S.
31 Win 30–1 Michael Rush TKO 5 (10), 2:40 Mar 12, 1999 Roseland Ballroom, New York City, New York, U.S.
29 Win 29–0 Garing Lane RTD 2 (10), 3:00 Jul 9, 1998 Grand Casino Avoyelles, Marksville, Louisiana, U.S.
26 Win 26–0 Jesse Ferguson UD 12 Jan 31, 1998 Etess Arena, Atlantic City, New Jersey, U.S.
25 Win 25–0 Tui Toia KO 1 (10), 3:08 Dec 4, 1997 Pepsi Arena, Albany, New York, U.S.
22 Win 22–0 Marshall Tillman KO 1 (8), 2:39 Jan 9, 1997 Beverly Wilshire Hotel, Los Angeles, California, U.S.
21 Win 21–0 Herman Delgado KO 2 (8), 1:37 Dec 17, 1996 National Guard Armory, Pikesville, Maryland, U.S.
19 Win 19–0 Brian Sargent TKO 1 (8), 1:24 Nov 8, 1996 Arizona Charlie's Decatur, Las Vegas, Nevada, U.S.
18 Win 18–0 Trevor Berbick UD 10 Oct 15, 1996 Convention Hall, Atlantic City, New Jersey, U.S.
17 Win 17–0 Mark Young TKO 3 (8) Aug 8, 1996 Sudduth Coliseum, Lake Charles, Louisiana, U.S.
16 Win 16–0 Martin Foster KO 2 (10), 0:57 Jun 9, 1996 Fernwood Resort, Bushkill, Pennsylvania, U.S.
15 Win 15–0 Tim Knight TKO 4 (8), 2:43 Jun 4, 1996 Martin's West, Woodlawn, Maryland, U.S.
14 Win 14–0 Steve Edwards TKO 2 (6), 2:34 May 3, 1996 The MARK of the Quad Cities, Moline, Illinois, U.S.
13 Win 13–0 Ross Puritty UD 10 Mar 26, 1996 Blue Cross Arena, Rochester, New York, U.S.
12 Win 12–0 Mike Mitchell KO 1 (8), 1:07 Mar 9, 1996 Etess Arena, Atlantic City, New Jersey, U.S.
11 Win 11–0 Bradley Rone TKO 1 (6), 2:27 Feb 9, 1996 Tropworld Casino and Entertainment Resort, Atlantic City, New Jersey, U.S.
10 Win 10–0 Mike Robinson KO 1 (6) Dec 13, 1995 Tropworld Casino and Entertainment Resort, Atlantic City, New Jersey, U.S.
9 Win 9–0 James Johnson TKO 3 (6) Oct 10, 1995 Blue Cross Arena, Rochester, New York, U.S.
8 Win 8–0 Matt Green TKO 2 (6) Sep 12, 1995 Martin's West, Woodlawn, Maryland, U.S.
7 Win 7–0 Carl McGrew TKO 1 (6) Aug 26, 1995 Bismarck Hotel, Chicago, Illinois, U.S.
6 Win 6–0 Larry Davis TKO 2 (6) Jul 13, 1995 Martin's Crosswinds, Greenbelt, Maryland, U.S.
5 Win 5–0 Eric Valentine KO 1 (4) Jun 6, 1995 Martin's West, Woodlawn, Maryland, U.S.
4 Win 4–0 Jeff Williams MD 4 Mar 28, 1995 Casino Magic, Bay St. Louis, Mississippi, U.S.
3 Win 3–0 Dennis Cain TKO 2 (4), 2:22 Jan 11, 1995 Martin's West, Woodlawn, Maryland, U.S.
2 Win 2–0 Robert Jackson TKO 1 (4) Jan 6, 1995 Virginia Beach, Virginia, U.S.
1 Win 1–0 Gregory Herrington KO 1 (4), 1:35 Dec 3, 1994 Caesars Palace, Paradise, Nevada, U.S.
^ "Las Vegas Review-Journal". Reviewjournal.com. Retrieved 2017-01-04. ^ "A heavyweight not to be taken lightly". Baltimore Sun. Retrieved 2017-01-04. ^ "Rahman to face Swindell on ESPN2 card in August". tribunedigital-baltimoresun. Retrieved 2017-04-25. ^ Cauvin, Henri (2001-04-18). "BOXING; Rahman Is Hoping to Block Lewis's Path to Tyson". The New York Times. ISSN 0362-4331. Retrieved 2017-04-25. ^ Press, From Associated (2001-04-22). "Knocked Out by Rahman, Lewis Champ No Longer". Los Angeles Times. ISSN 0458-3035. Retrieved 2017-04-25. ^ "USATODAY.com - Don King signs Hasim Rahman". usatoday30.usatoday.com. Retrieved 2017-04-25. ^ http://www.washingtontimes.com, The Washington Times. "Rahman's first defense vs. Izon". The Washington Times. Retrieved 2017-04-25. ^ SPRINGER, STEVE (2001-06-22). "Rahman Decision Packs a Big Punch". Los Angeles Times. ISSN 0458-3035. Retrieved 2017-04-25. ^ "On This Day: Lennox Lewis gets sweet revenge over Hasim Rahman in Las Vegas - Boxing News". Boxing News. 2016-11-17. Retrieved 2017-04-25. ^ Hoffer, Richard. "Payback Ending Hasim Rahman's seven-month joyride as the heavyweight champion, Lennox Lewis regained the title and a measure of respect for his career". SI.com. Retrieved 2017-04-25. ^ Freeman, Mike (2002-06-02). "BOXING; After Fight Is Stopped, the Winner Is Holyfield". The New York Times. ISSN 0362-4331. Retrieved 2017-04-25. ^ "Rahman wants Klitschko! - World boxing - Boxing news - BOXNEWS.com.ua". www.boxnews.com.ua. Retrieved 2017-04-26. ^ "Manager: Klitschko is 'done for good'". ESPN.com. 2005-11-09. Retrieved 2017-04-26. 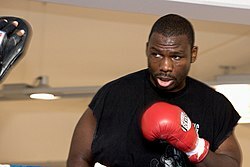 ^ "Hasim Rahman Prepares to Accept WBC Heavyweight Title - Boxing News". www.boxingscene.com. Retrieved 2017-04-26. ^ "Judge releases Rahman from contract with King". Sports.espn.go.com. 2005-12-10. Retrieved 2017-01-04. ^ "BBC SPORT | Boxing | Rahman keeps crown following draw". news.bbc.co.uk. Retrieved 2017-04-26. 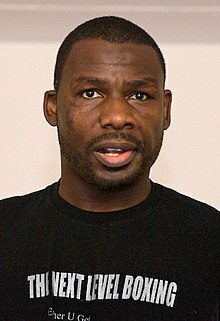 ^ "Hasim Rahman vs Taurus Sykes on June 14 • Boxing News". Boxing News Archive. 2007-05-07. Retrieved 2017-04-26. ^ "Fight Hasim Rahman W UD 10 (10) Taurus Sykes - Boxing news - BOXNEWS.com.ua". www.boxnews.com.ua. Retrieved 2017-04-26. ^ "Fight Hasim Rahman W TKO 10 (10) Zuri Lawrence - Boxing news - BOXNEWS.com.ua". www.boxnews.com.ua. Retrieved 2017-04-26. ^ "James Toney Stops Hasim Rahman, Question Marks Left - Boxing News". www.boxingscene.com. Retrieved 2017-04-26. ^ "Toney vs. Rahman Result Changed To a No-Decision - Boxing News". www.boxingscene.com. Retrieved 2017-04-26. ^ Claudio, EJ. "My Thoughts On Wladimir Klitschko vs. Hasim Rahman". Bleacher Report. Retrieved 2017-04-26. ^ agencies, By Telegraph staff and. "Vladimir Klitschko KO's Hasim Rahman". Telegraph.co.uk. Retrieved 2017-04-26. ^ Vester, Mark (June 20, 2010). "Hasim Rahman Destroys Shannon Miller in Four Round". BoxingScene.com. Retrieved June 20, 2010. ^ Kim, Jason (June 20, 2010). "Rahman stops Miller". BoxingNews24.com. Retrieved June 20, 2010. ^ "Ready or not, Rahman gets a shot". ESPN.com. Retrieved 2017-04-26. ^ Johnstone, Duncan (2014-04-02). "Hasim Rahman to fight in NZ 'Super 8' bout". Stuff.co.nz. Retrieved 2017-04-26.